True story: When my kids first started asking for pillow pets, I told them they needed another stuffed animal like they needed a hole in their head. I know, so nice and loving, right? They continued asking, talking about them, telling me Santa would bring them one, singing "it's a pillow, it's a pet, it's a pillow pet". I kept envisioning the pillow pet in the bucket of other stuffed animals in the far corners of the basement. They have more stuffed animals than we know what to do with, and never once have I seen them play with them. When pillow pets approached me with a giveaway, I went ahead, they sent my girls a pillow pet and did I ever eat my words. Those pillow pets have been loved, played with, slept on and used more than any other toy they have. And so, they have grown on me. I'm highly impressed with their animal selections, everything from triceratops to magic unicorn. They are one of the hottest Christmas items, so I'd suggest you get yours now. You won't regret it, and if you wait too long they might be sold out. One of my favorite features of the pillow pet (aside from the fact that they're washable! Just let them air dry), is that they fold up allowing your kids to put their p.j. 's and toothbrush inside the pillow pet for overnight visits to grandma's house. Today they are giving a pillow pet of your choice away to one lucky winner. Seriously, you want to win this. You will absolutely be the winner of the best Christmas present this year if your child opens a pillow pet. I'm a total believer after our experience. Which Pillow Pet would your child love to have? Pillow Pets is granting extra entries if you follow THEM on facebook or on their blog and.. I'm granting extra entries for following T+T, fb posts, twitter posts, blog entries etc. Leave a link back for each individual method you use. Good Luck and Thank You Pillow Pets!! I recently saw some of these at a store and thought they were so cute! I would love to win the lion. Lovin' the t-rex and the alligator---too cute! My kids are obsessed with these! We are planning on getting them for Christmas. It would be great to win one! My daughter would love "Ms. Lady Bug"
Ha! My kids sing their jingle non-stop and everytime we pass them in the store they beg for one...so winning this giveaway would allow me to cross one thing off my Christmas list! MY DAUGHTER IS BEGGING FOR A PILLOW PET! She loves the blue dolphin and tells me every time it is on t.v. and knows the song by heart! My kiddo really wants a dolphin! My son would love the t-rex! My boy and the frog would go perfectly together! pretty sure my little girl would die over the dog. My daughter would love the cat!! My little boy would LOVE the elephant!! My girl would love the unicorn and my boy would die for the triceratops! Thanks for the chance! My name is Lane a and we would love Panda or the turtle. They are so cute! 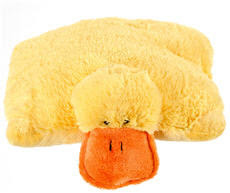 I want the puffy duck (my son would prefer the snuggly puppy, but what he doesn't know can't hurt him!). My daughter would love the Cuddly Bunny. My son isn't really old enough to have a favorite, but he just learned to say "gucky," so maybe I'd choose Puffy Duck for him. My daughter was sold on the ladybug until she saw the unicorn :) One of her friends got one for their birthday and I think we will need to have Santa deliver one to her for Christmas. My girls have been pestering me about the unicorn one in particular. Of course my response was also "not another stuffed animal!" 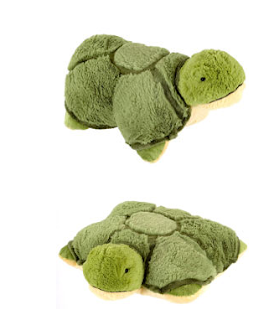 The Tardy Turtle is adorable...my son would love it! Fun! My son would probably love one of the dinosaurs. I'd have to go with the triceratops! I would choose Nutty Elephant! These are so cute! The turtle is just the cutest! We'll take one (or two)! HEY...I want to win the Penguin one! I love penguins! both of my kids want one of these! My son would love the monkey or the triceratops. These are definitely going to make great christmas presents! I am loving the nutty elephant-so cute! I know my little girl would love the cuddly bunny...the monkey is cute too! I love the triceratops pillow. It's adorable. My niece and nephew have a thing for dinos. I would be the best aunt ever. My daughter has the hippo and adores it. I would love the bear for my son. I know a 2 year old who would really like this. I would probably get the horse for my little girl, but they are all so cute!! I think I would go with either the giraffe or the turtle. My girls would love one of these! My daughter would be in heaven if she won the unicorn. thanks! My daughter can not get enough of these. Unfortunately, her first one is reaching its lifetime. It has been loved alittle too much. Oh how she would love a new pink pig. a triceratops would be fabulous! My favorite is the hippo pillow. These look so fun! I love the chocolate moose! Too cute! My 18 month old daughter would love the duck. "Duck" was her first word; followed closely by "cack, cack, cack" (quack, quack, quack). She's just discovering the joys of a pillow. my son has been talking about these dang things non-stop., I would think the alligator or the frog he would like...but then I would need to get one for my daughter too...hmmmm...I cant decide! Does that cute little girl come with it? I'm liking the turtle for Cash. Kailyn has the unicorn and it's so snuggly. I know my little girl would love the cuddly bunny! my daughter would love the squeaky dolphin!!! so cute! Seriously, those marketing people are brilliant. My kids have been begging for pillow pets for months! Elizabeth likes the ladybug. I think my favorite is the traditional teddy bear. For Harrison, I'd say panda, polar bear of shamu. oh, the jolly giraffe or mr bear - so cute! The Thumpy Bunny is way too cute!! It would for sure be loved around our place. I just started following your blog. Why has it taken me SO long. Your blog is great! My son loves pandas. He has been working on his happy chart to save up for a pillow pet. I would love to win one. Zippity Zebra would probably be a great pick for my 3 year old. Her older sister has the unicorn and LOVES it! My daughters would love the puppy! the duck is definately my favorite, but libby does love pigs.... do they have pigs? we'd love the elephant-- too cute! My son would love the panda. Just like you, I have the same reservations. He'd love it if one suddenly appeared at our house. My boys are BOTH dying for the bee. I keep telling them they can't both get the same one, but they continue to ignore me! I like the turtle best. I would love the panda pillow pet for my little sister. She absolutely loves panda's and wants one of these so bad! Oh how fun! My boys would adore the snuggly puppy...so so so soft and cute! I have got to have the Ladybug for my little Katydid. She squeals like mad every time she sees one. my daughter has wanted one forever. And I keep telling her Christmas! She wants the Unicorn. And every time I go to Target to get one... they only have the same ONE unicorn that looks like it has been used for months. I don't know why they never get ones. So, yes, we would love to win the unicorn. That turtle is TO DIE FOR! My son would absolutely love one! Thanks for the chance! Our daughter has wanted one forever. She loves the Unicorn. I think my little girl would love the hippo - so cute! I like the duck though. My son would pick the Pterodactyl hands down!! oh my gosh! my kids want a pillow pet so bad. my older son has requested a dolphin, and i still haven't decided which kind i would get for little boy #2... so many fun choices!! did a post on blogger! My children keep asking for one!! They are hoping Santa bring them each one. My son wants the bumblee bee and my daughter wants the dog. We love the penguin or the turtle. My son has been asking for one for awhile but like you we have too many stuffies in the house already. You might have sold me on one though. Love the idea of stuffing it to go to grandma and grandpas. my little guy would love the triceratops. My little girl has been begging for one for Christmas too! She would love the magical unicorn or the zippity zebra. Oh I hope I win! I love the icy polar bear, my friend is due any day now, would be a perfect gift to bring to the hospital to greet her little one. I am not even kidding. Quincy has been dying for a pillow pet. Oh, the power of commercials. I think she has already set her heart on the purple hippo. We need the zebra at our house! So cute! I follow t&t in google reader! My daughter would die for the LADYBUG!!! She is asking everyday when chistmas is coming and if santa is bring it!!! I just love that hippo....cute shape and cute colors too! i love the pig. and the cat. wait, i guess this isn't for me. my daughter would LOVE the cat. she obsessed with kitty kitties and her current kitty kitty stuffed animal has definitely seen better days. i follow tangled & true (since 2006!! My boys would love the cow and the panda. This has been a request from my 5 year old for Christmas! I am a proud Tangled & True follower! I want to follow their blog, but I can't find it. Ooh, it would be a toss-up between Triceratops and Alli Alligator! My daughter has been BEGGING me for one of these! She loves the thumpy bunny one! Just found out my daughter is obsessed with Pillow Pets!! Hope I win one from @tangledandtrue !! My son would love the white bunny. He got to pet one at a Fall Festival and has been obsessed ever since! Thanks! hah my kids say the ame thing but I havent bought them!! We would love the penguin!! I think the hippo one his adorable! Oh man, I don't know. Jolly Giraffe, Zippidy Zebra...they are pretty darn cute! My daughter would love, love, love the ladybug! She has always loved ladybugs!! Awesome! We love Pillow Pets. My son and daughter would both LOVE the dog. My little ones would love on that elephant! It's a toss up between the bumble bee, triceratops and turtle. I'd let my daughter decide so I wouldn't have to. the turtle is too cute! thanks for the chance! My daughter has been talking about the unicorn for a long time now. Thanks for the chance to win one! Wiggly pig would be a welcome addition at our house. The elephant is just adorable! I know he would be a welcome addition to our home! My son would love a turtle! They are so soft! i feel the same way about stuffed animals, but my son really wants the frog one, and my daughter the unicorn... the unicorn is actually kind of cute! My daughter would love the magic unicorn. She's obsessed with them and princesses. I have three daughters, and any one of them would love the cuddly bunny pillow pet! My son would love one of these both my older boys use big dogs for pillows! !The trex and the dog would be awesome!! Ooh, the Ms. Sassy Cat for my little girl. My three year old would adore this! She totally squealed at the turtle, so I've going to have to do with that one! Oh these are SO cute. My Little one would love the hungry hippo. She's obsessed thanks to Madagascar! Love it! My two year old loves ducks...please send her puffy duck...we'll keep our fingers crossed. My kids would like the Lady Bug Pillow Pet. My daughter would love the elephant one - she really likes elephants, and has been asking for a pillow pet! I definitely planning on getting my sweet daughter one for Christmas! I better get on that.